Drs. Justina Harold and Chad Reel welcome patients to receive gentle, effective dental care from their inviting San Angelo practice. Our dentists ensure that every patient entering Reel Family Dentistry feels comfortable and has their dental needs properly tended to. Our team is committed to delivering high-quality services to protect and maintain your teeth and their supporting structures. With modern dental techniques and a dedicated staff, we ensure a patient’s smile improves in not only its appearance but its oral health as well. If you are looking for dentists with experience in helping patients achieve their goals, call our San Angelo practice to schedule a consultation. Our dentists are conservative when recommending treatments, never advising patients to receive a dental service that doesn’t help them reach their desired smile. 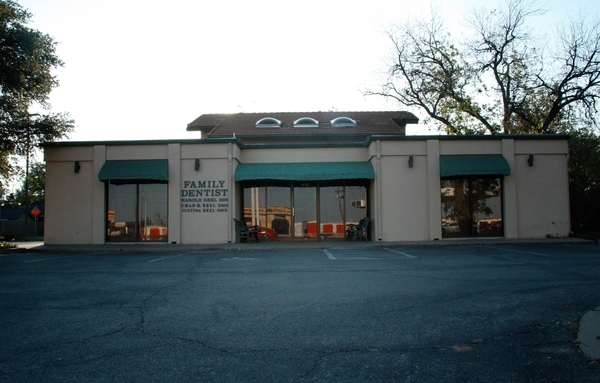 Our practice is known for our friendly atmosphere and our efficient, comprehensive dental care. The dental professionals at Reel Family Dentistry know how oral health and one’s general well-being are interconnected. Addressing a patient’s dental concerns early on reduces the impact bacteria has on the body and stops issues before they require complex solutions. Drs. Harold and Reel make the effort to get to know their community. Patients that trust our dentists are much more comfortable when receiving treatments at our practice. We never stop striving to provide the best dental services for our patients and continuously push ourselves to find solutions based on a patient’s preferences, oral health, and goals. With a calming environment and our gentle approach to dentistry, we make sure every patient’s visit to our dental office is a pleasant one. We understand that many of our patients have busy lifestyles, so we do everything we can to keep them in the waiting room for as little time as possible. When our San Angelo dentists recommend a treatment, they sit down with the patient and thoroughly explain the process and how it benefits them. Our dental professionals want to make sure the patient understands the importance of the dental care they receive and why they have been advised to proceed with the service. Come by Our San Angelo Dental Office Today! Our dental team wishes for you to learn more about our dentists, their staff, and our practice. At Reel Family Dentistry, we enjoy helping patients achieve their ideal smiles with our quality dental services. For more information about the treatments we provide, contact our dental office today!